Briskair have recognised the need for Electric refrigerated cooling systems from Client feedback. Our Technical team has played a large part in designing the Pure Air Full 134A refrigerant Electric Cooling System. Client feedback tells us that this product has been successful because of its quiet noise output, yet it has an efficient cooling output. The Pure Air is classed as the Little brother to the KoolKat. The Pure Air system is designed for smaller sleeper cab environments, with an output of 5600 BTU this unit is sure to impress the client wanting to up-grade in Performance & Budget, from Evaporative cooling systems. The system is 12 or 24v & designed to run from the vehicle’s crank batteries with a built in low voltage sensor/shutoff. Run time is approx. to 4 hours, subject to battery age. However we strongly recommend to increase the system run time, to discuss with our sales team the option to include additional Deep cycle batteries to your Installation. This will enable longer run time with no reliance on the vehicles crank batteries. Approx. run time extension up to 6 hours. Choose our Pure Air System, if you sleep in your truck most nights of the week, if you are a fleet operator, budget conscious & have tried the Evaporative systems and want to up-grade to a Refrigerant cooling system. 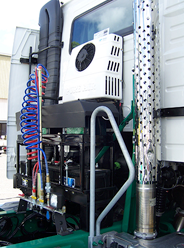 Our Pure Air Systems command industry respect with high volume sales around Australia, we consider them the next level above Evaporative cooling system in today’s competitive sleeper Cab cooling market.